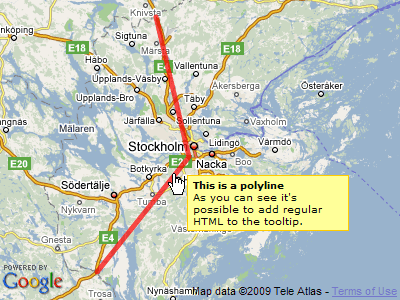 One of the shortcomings in the Google Maps API is that there’s no easy way to add tooltips to polylines and polygons. That’s why I felt inclined to build an extension to Google Maps that adds that functionality. MapTooltip makes it possible to add tooltips to any kind of overlay. It’s even possible to have HTML inside it and to style it to fit your design needs. In a project I’m working on there’s a need to have tooltips on polylines. I have tried to find simple ways of doing this but haven’t been able to find any. After researching this and eventually coming up with a solution I decided to package it into a small library so that I could share it with fellow Google Maps developers. The constructor creates an object of the type MapTooltip. It takes two required arguments and one optional. The first argument, reference, is a reference to the overlay that you will attach the tooltip to, for example a GPolyline. The second argument, tooltip, is a string containing what will appear inside of the tooltip. You can either provide just a plain text string or some HTML. To use MapTooltip is pretty easy. First add a Google Map as you normally would. Then follow the steps below to attach a tooltip to an object in the map. Import the library to the web page with the script tag. Add a mouseover event to the object on your map that you wish to have a tooltip. You will also have to add a mouseout event that removes the tooltip. That’s it. Be sure to check out the live demo to see it in action. The demo includes tooltips attached to markers, polylines and polygons. One of the tooltip is styled in a different way using the opts parameter. 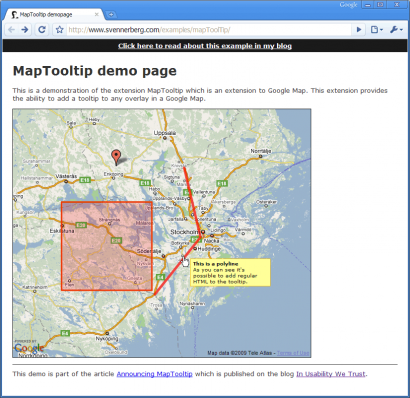 MapTooltip is released under the MIT License and is free for any use. MapTooltip is heavily influenced by the article Custom Info Window / Popup for Google Maps, or Loving the GOverlay. If you import the Google Maps API with ver=2.x it’s not going to work as expected since it seems that it doesn’t handle mouseover events on GMap2 when the pointer is over an GOverlay quite the same way as in previous versions. I don’t know if this is a temporary glitch or if it’s supposed to work this way in the future. Update [2009-04-11]: In the latest release of the Google Maps API the above mentioned problems currently occur. I will try to find a way around, but until then you can stick to version 2.151 to make it work correctly. For ideas on this or for other bugs you might encounter, please contact me either in the comments or through the Contact page. This is great! If you’re interested in adding it to the utility library, send me an email. Great! I was looking for something like that for quite a while. Something strange is happening in the demo. The marker works as expected, but the polyline and polygon don’t show the tooltip until the cursor leaves the item of interest. Dave: The problem you’re experiencing is due to that Google is changing the API. I thought that running version 2.151 I would be safe, and yesterday when I checked it worked, but today it doesn’t. I tested again right now and now it seems safe to run version 2.149 or below of the API. I have updated the example accordingly. Naturally I need to find a way around this issue so it’s possible to run the latest version of the API, but so far I haven’t come up with a solution. congratulations for this library ! Message : ‘__e_’ a la valeur Null ou n’est pas un objet. Nice job bro… but unfortunately i cannot use it in v3…..the tooltips displays unconsitently… with large number of polygons.. some time even more than one tooltips shows when the number of polygon is high……hope you will try in more than 10 polygons and fix the bug as soon as possible…. LOVE THIS, but can’t get it to work!!!! Angie I’m glad that you got it to work and that you like it! Good luck with the coding! do you have some news about mouseover problem with recent v2 api ? It’s actually not your script – it a appears to be bug in the latest API. I tried version 3 and the problem is still there. So it looks for now, like we’re stuck with 2.149. Tyler: I’m glad to hear that you find it useful. I suggest that we file a bug report to the Google Maps API. It would be sweet if they could fix that so that it works in newer versions of the API. I am glad to find this tooltip. But I have the same problem as No.5. It works for simple polygon. but I count not work out with polygon array. I am looking forword to hearing any advice. Found one more bug. When I zoom in map, tooltip wont dissappear after I move mouse out of polygon. It shows some kind of “Uncaught TypeError: Cannot call method ‘removeChild’ of null. MapTooltip.remove” in mapTooltip.js 108 row. + it drops some errors from main.js, so it seems like it’s kind of problem with API too. Seems to work fairly well. You may want to remove the memory leak moving the mouseout event binding outside the mouseover function. Right now it keeps adding mouseout events. Oh , really great , that’s what i am looking for. But i have a question , can we modify this class so that it has rounded corners and it can be crossed the map boundries , just like the yelp style google map info window. Your solution works really fine for Google Maps API version 2.x. Do you have an solution or code snipplet for version 3.x?